Slaughtneil confirmed themselves as the kingpins of Ulster club football with a victory over Cavan Gaels in The Athletic Grounds on Sunday evening. Not only did this crown their footballers as Ulster Champions for the 3rd time in 4 seasons, their win ensured the clubs ‘double treble’ with the hurlers, camogs and footballers now claiming Ulster Senior titles in consecutive years. Slaughtneil opened the scoring 33 seconds into the game. Chrissy McKaigue starting an attack which was finished off by a Shane McGuigan free after Christopher Bradley had been fouled. Bradley then got on the score sheet himself when he split the posts 8 minutes later. His side converting 40% of their scoring chances in the opening 10 minutes. Cavan Gaels registered their first score 60 seconds later. Martin Dunne slotting over a point before Slaughtneil answered back in emphatic fashion. A turnover and driving run out of defence by captain Pasty Bradley created the counter attack which ended with Ronan Bradley notching his team’s third point of the match. Shane McGuigan was once again on target as his two points (one free) put Slaughtneil 4 in front. His second coming as a result of another turnover in defence by Patsy Bradley. 2/5 of their scores coming from turnovers. Their next score came from McGuigan once more. Francis McEldowney won a short kickout before a lung busting run along the side line by Chrissy McKaigue set up McGuigan for his 4th of the half. Cavan Gaels then answered back with 3 of the halves final 4 points. Seanie Johnston grabbing their second with a pointed free, converting only their 2nd point from 9 shots. Martin Dunne slotted over his second to close the gap to 3, before Slaughtneil went 4 up again through Se McGuigan after Karl McKaigue got up to assist the attack. The final action of the half came with Cavan Gaels scoring their 4th of the game. This time through wing half back Stephen Murray after Cavan Gaels retained their own kickout. 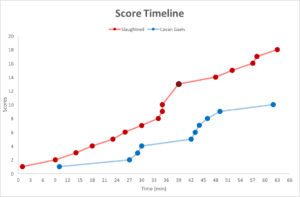 Meaning that 75% of their scores in the opening 30 minutes originated from their own kickouts. 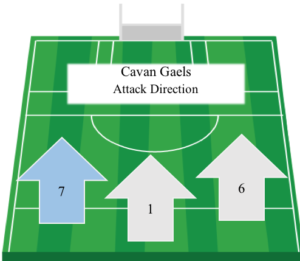 Cavan Gaels accuracy in front of goals had let them down in the first half as they converted just 4 of their 12 shots. 3 of these coming in the final 3 minutes. Cavan Gaels hit 3 wides, with 3 shots dropping short and 1 hitting the post. However, they did manage to get a shot off 12 times out of their 14 attacks in the opening 30 minutes. While 13 of their attacks came down the wings, as they attempted to stretch the Slaughtneil defence. 4/7 of Slaughtneil’s scores in the first half came from winning kickouts as they won 11 out of the 18 restarts in the opening period. 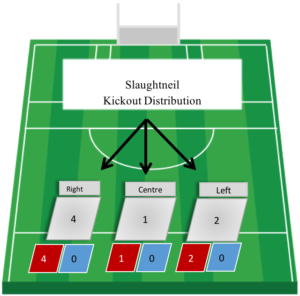 Slaughtneil also retained 100% of their own 7 kickouts, winning all of them short. Slaughtneil’s ball carrying ability was also clear in the first half as they carried the ball into attack; 8/17 attacks. Midfield duo Pasty Bradley and Padraig Cassidy along with the McKaigue brothers Chrissy and Karl often running from deep, attacking the opposition half. Cavan Gaels had a brilliant chance straight from the throw in to narrow the margin at the beginning of the second half. But a Martin Dunne wide prompted a step up in intensity from Slaughtneil as the Derry Champions rallied off 1-4 in the next 10 minutes. Putting them 9 ahead and effectively killing the game off with Cavan Gaels now facing a massive uphill task. It was Chrissy McKaigue who once again got forward to open the second half scoring. A diagonal pass from Christopher Bradley set up Brian Cassidy who converted from close range. It was Ronan Bradley’s turn to step up as he kicked his second of the game, 30 seconds after Cassidy’s score. 4 minutes later the first and only goal of the game arrived. When Man of the Match Shane McGuigan placed the ball into the corner of Ciaran Flynn’s net. Following great work from full back Brendan Rogers and Padraig Cassidy after another turnover in defence by the ever reliable Patsy Bradley. 1-3 of their total now coming from turnovers as they led 1-10 to 0-4. Cavan Gaels did manage to get off the mark 10 minutes into the second half. Sean Johnston stroking over 2 points from dead balls while Martin Dunne also scored his 3rd of the game. Playmaker Michael Lyng assisting Dunne’s point. Wing half forward Niall Smith also got into the action during the Cavan sides purple patch as his score reduced the deficit to 5 with 15 minutes left to play. Cavan Gaels should have scored, what would have been their 5th point in a row. However Declan Meehan dropped his shot into the keeper’s arms, providing another counter attack for Slaughtneil and another point for McGuigan. Francis McEldowney getting up in attack to provide the assist helping Slaughtneil into a 6 point lead. Cavan Gaels did try hard to rally a comeback. Full back Niall Murray raced forward searching for his side’s 9th point. But it wasn’t to be as Slaughtneil again stepped up a gear to fire over the next 3 scores. These scores came from Brian Cassidy, Christopher Bradley and Shane McGuigan as Slaughtneil began to hold up possession and kill the game off. Cavan Gaels 10th and final point came from the boot of Martin Dunne, who registered 40% of their scores. However it was Slaughtneil who produced the final point of the game. Christopher Bradley swung over his 3rd point to leave his side 8 points ahead at the final whistle with a score line of Slaughtneil 1-15 Cavan Gaels 0-10. Cavan Gaels’ accuracy did improve slightly in the second period, as they converted 6 out of their 11 shots. However through the entire match they kicked 6 wides and dropped 5 shots short. Resulting in a shot accuracy of 43%. 50% of their 10 scores came from winning their own kickouts. As they won a total of 18/24 of their own restarts. 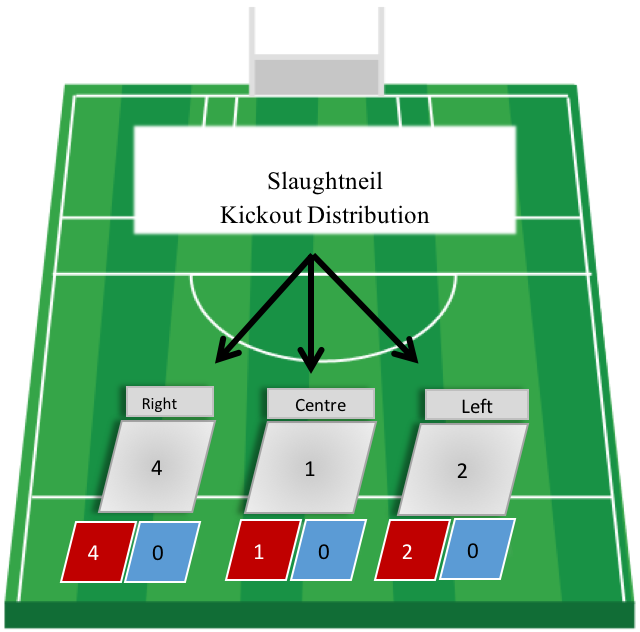 Slaughtneil once again dominated their own kickouts in the second period winning, 7/9 (3 short). Winning a total of 14/16 throughout the 60 minutes, with 4 of these being converted into scores. 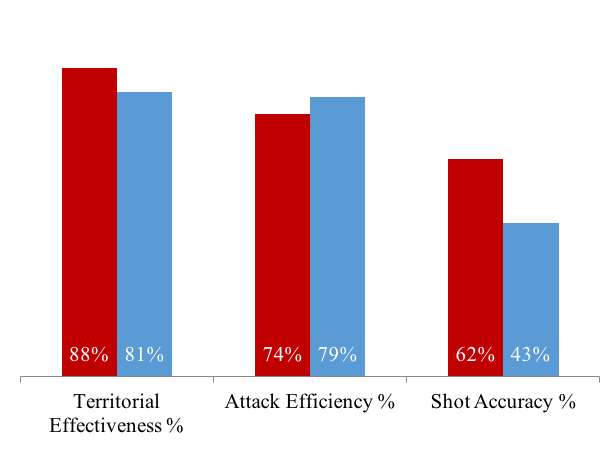 However their primary source of scores came from turnovers as they scored 1-7 from counter attacks. Turning their opponents over 17 times throughout the game. 13 times in their own defence. Slaughtneil: Antoin McMullan, Paul McNeill, Brendan Rogers, Karl McKaigue, Francis McEldowney, Chrissy McKaigue (0-1), Keelan Feeney, Patsy Bradley, Padraig Cassidy, Ronan Bradley (0-2), Shane McGuigan(1-6), Gerald Bradley, Christopher Bradley (0-3), Se McGuigan (0-1), Brian Cassidy (0-2). Subs: Barry McGuigan for G. Bradley, Padraig McGuigan for R. Bradley. Black Cards: Peader Kearney for F. McEldowney.